In November of 1985, an American pilot working in El Salvador, Wally Grasheim, and a veteran CIA officer, Felix Rodriguez, were both deeply involved in covert operations to aid the U.S. effort against the Nicaraguan Sandinista government and other leftist groups in Central America. In a transcript obtained by Unicorn Riot, it seems as though the men created an attack plan similar to the operation that set off the Iran-Contra scandal less than a year later. On January 2, 1991, Grasheim furnished a recording that he claimed was made with Rodriguez in El Salvador on November 11, 1985 to the Office of the Independent Counsel (OIC) of Lawrence Walsh. At that time, Independent Counsel Walsh had already successfully prosecuted several former Reagan officials, and was gearing up for the last set of indictments. In the transcript, Grasheim works through a plan with Rodriguez to launch a low-tech Contra aerial attack against the joint civilian-military Sandinista-controlled airport in Managua, while debating how to expand their covert aerial warfare operations into 1986. Unicorn Riot received the transcript from researcher Michael Best (@NatSecGeek) who obtained it from the Walsh investigation archives. We attempted to reach Rodriguez to verify the authenticity of the recording via the Bay of Pigs Museum in Miami, where today he works as the Executive Director, and were given no response. The recording shows Grasheim and Rodriguez were trying to advance the Contra cause by giving them “publicity” of a successful Contra attack, with U.S. support, against Nicaragua’s government, using the same sorts of tactics, personnel and equipment that was exposed in October 1986. What was Iran-Contra and why does it matter today? In the narrowest sense, Iran-Contra is a sprawling geopolitical scandal that entered the public eye with the air crash of Corporate Air Services HPF821, the C-123K registered to Southern Air Transport, which had been a CIA-operated airline company since 1960. Details of US arms sales to Iran were exposed by the Lebanese magazine Ash-Shiraa less than a month after this crash. Less than a year after Grasheim’s recording, on October 5, 1986, the Nicaraguan military shot down the C-123K (serial HPF821, tail N4410F) on a mission organized by Rodriguez to send arms to the Contras with a U.S. crew. Crew member Eugene Hasenfus was captured and explained his mission, setting off the international scandal that eventually led to dozens of criminal charges against Reagan Administration officials. “Iran-Contra” is one way to reference aspects of American covert policy in South and Central America. As Unicorn Riot’s 2017 mini-doc Crisis: Borderlands discusses in interviews with organizers in Arizona, America’s covert wars in the region dislocated millions of people, ultimately setting off waves of migration into the United States that continue today. In a much broader sense, “Iran-Contra” was the main label for the arena of exposure around American-led covert operations that unfolded in the 1980s and early 1990s. It involved the steady documentation of CIA-involved covert arms deals that fed several wars, and a large set of prosecutions of government officials. By 1990, “Iran-Contra” had become a series of blue-ribbon investigations, a time of intense scrutiny of America’s covert political operations. Iran-Contra style covert operations may surge once again during the Trump Administration due to a return of key Iran-Contra figures once again plugging in with senior officials. Former Attorney General Ed Meese helped set up the Trump Administration, and Oliver North was spotted in Trump’s box at the high profile Army-Navy game after the election. Classified Federal Emergency Management Agency (FEMA) operations were also reviewed in Iran-Contra hearings. Last year, Unicorn Riot discovered through a data request, that FEMA “Field Force Operations” are part of a nationwide riot police training curriculum. Interestingly, Wally Grasheim’s tape illustrates three phases of Iran-Contra at once: the late 1985 run-up just before the Contra campaign entered its final covert phase; the impending arrival of the C-123 planes that triggered the scandal’s exposure in October 1986; and another big push of exposure and pressure on public officials in early 1991. In 1985, Grasheim was actively in the field with Contras supplying them with weapons and material while helping them organize attacks on Nicaragua; historians and government investigators generally agreed on this later. Assuming the tape is indeed authentic, it documents how Felix Rodriguez met with Grasheim. The first thing they discussed was how to coordinate airstrikes. The following is a transcript, lightly edited for clarity, of a tape that has been purported to depict a conversation between Felix Rodriguez aka “Max Gomez” (FR/MG) and Wally Grasheim (WG) which allegedly took place in El Salvador on November 11, 1985. (Max Gomez is the same alias crewman Hasenfus stated after his capture.) While the positive identification of the participants has not been confirmed despite enhancements performed by the Department of Defense, they were also unable to find any indications that the tape was anything other than what Grashiem claimed. Here Rodriguez brings up the key news: new aircraft. Rodriguez continues to hear out Grasheim’s plan, and they debate how many anti-aircraft guns surround the area. Missions with the two cargo aircraft they both describe here foreshadowed the incident less than a year away: a “U.S. crew” on a C-123 entering Nicaragua gets shot down, setting off the biggest political scandal of the 1980s. How did Grasheim’s recording fit into later investigations? Government investigators from the DOJ Office of Inspector General detailed a conflict between Grasheim and Celerino “Cele” Castillo III, a former DEA agent. Castillo had been stationed in the region to help the DEA find traffickers, and one of his informants claimed that Grasheim was masterminding cocaine trafficking through restricted access hangars in the military side of Ilopango Airport near the capital of El Salvador. The 1997 DOJ OIG report covered Grasheim’s role in detail – including how a source at the US Embassy in El Salvador told Castillo that Grasheim had said “everybody else was going to go down with him” if he got arrested — and that he’d made recordings to protect himself. Thus Grasheim’s motive to make this recording with Rodriguez, a regional (if unofficial) coordinator for the CIA, is logical from his perspective, as it would help prove that he wasn’t an isolated actor in setting up these covert operations. “[Cele] Castillo’s report stated that on August 28, 1986, he had advised the U.S. Ambassador in El Salvador, Edwin Corr, of Grasheim’s illegal activities. Corr said that Grasheim was at one time employed by the United States Embassy Military Group (Milgroup) in El Salvador. According to the report, on September 1, 1986, based on surveillances and informant information that Grasheim was in possession of drugs and weapons, the Salvadoran police searched his residence in El Salvador and seized a small amount of marijuana, plastic explosives, cases of grenades, sniper equipment, silencers, anti-tank rockets, machine guns, pistols, night vision equipment, military radios, and an undetermined amount of ammunition for a variety of weapons. Three vehicles were also seized, one of which had a license plate registered to the U.S. Embassy. The Embassy denied the license plate belonged to it. […..] Castillo’s report stated that he and Rivera next interviewed General Adolfo Blandon, who had recently been contacted by Grasheim. Grasheim had asked General Blandon to certify that Grasheim’s possession of the weapons found at his residence was legal. Blandon had declined to do so. Castillo also reported that he had interviewed an unidentified source of information at the U.S. Embassy in El Salvador. This source said that Grasheim had contacted a member of the U.S. Milgroup at the Embassy and had threatened that if he “was arrested, then everybody else was going to go down with him.” According to the source, Grasheim said that he had telephone recordings of conversations with other members of the Milgroup. Grasheim denied that he had been the main player in cocaine smuggling, later suing several former government officials including Castillo for defaming him. In brief it’s worth noting that Rodriguez was a key figure in many areas of covert operations for the CIA. He joined as a teenager in 1960 and participated in the Bay of Pigs invasion, as well as operations of the JM-WAVE CIA station in Miami. 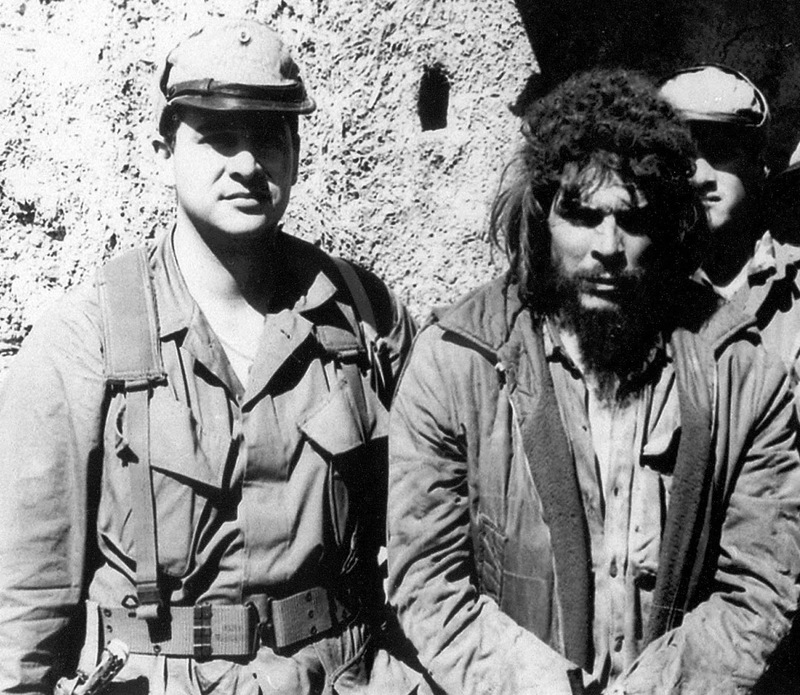 The CIA dispatched Rodriguez to Bolivia where he played a critical role in capturing the Cuban revolutionary Ernesto “Che” Guevara. He later participated in CIA’s Phoenix program in Southeast Asia which used widespread torture as an instrument of counterinsurgency. In 2014 the journalist Chuck Bowden investigated the fate of DEA agent Enrique Camarena who was murdered in 1985. Bowden was able to revisit the area that his late friend Webb had looked at during the 1990s. Through retired DEA agent Hector Berrellez, Bowden was able to meet with witnesses to Camarena’s death, which they attributed to someone people called “the Cuban”, i.e. Rodriguez. The events around Camarena would have unfolded just months before this recording. While Iran-Contra seems distant today, many new documents like this one are coming to light in 2017. The CIA ‘CREST’ database of released materials finally reached the Internet in January, and researchers have been poring over the new materials in detail. The release is already yielding results, as one report located in the database documents attempts to cover-up the affair and obstruct the investigation. Other new explorations of Iran-Contra have documented the problems with various investigations. These include the Tower Commission’s conflict of interest resulting from the lead Senator’s brother-in-law having been a CIA gun runner tied to Iran-Contra. Other recent releases show that the federal government has begun reclassifying information about Iran-Contra. Iran-Contra continues to resurface in American popular culture with media exploring related stories such as Kill the Messenger (2014), Freeway: Crack in the System (2015), the 2015 Narcos series, American Made (2017), and a series in development about Oliver North. Michael Best contributed writing to this article. 1: Since Grashiem didn’t tell Rodriguez about the plan, he assumed that General Gorman had. According to Grashiem, Rodriguez told him that he was talking to both the White House and the National Security Council, a fact confirmed by other documents. 2: Contras attacked the Managua airport in September 1983 using two aircraft including a Cessna. Covert operations pilot Barry Seal crash-landed at the Managua airport in May 1984 on “his first DEA-sanctioned cocaine run.” The DEA then provided Seal with a C-123K he nicknamed “The Fat Lady”. In June 1984, Seal ran a sting to collect photos of Nicaraguans loading drugs onto the C-123K, which was publicized by President Reagan on national television. After the sting, the C-123K was sold to Southern Air Transport, and was one of the two C-123s scheduled to arrive at “Christmas” 1985 that Grasheim and Rodriguez discussed on the recording. Iran Contra Christic Institute Archive.